Senior ministers from the G7 nations will tomorrow meet in Sicily for their annual summit. The focus on this year’s event – aptly, given its location – is on dealing with migration from Africa and the global displacement crisis. This focus is timely. As we approach the summer months, we can expect a spike in the number of refugees and migrant attempting to across the Mediterranean to make it to Europe. We will again be confronted with Europe’s abject failure to agree and enact a collective, humane and effective refugee policy. I have written previously on the UK’s refugee policy and as a Labour advisor travelled to Lebanon to understand the conditions Syrian refugees were facing in the region. But last bank holiday weekend I went to Calais to volunteer with various refugee and migrant support charities. These organisations, almost entirely staffed by volunteers, work daily to distribute meals and essential items of clothing to the several hundred refugees and migrants still in Calais. Whilst there I spent time preparing food, making emergency distributions of food, water and tea to Afghan and Eritrean migrants and sorting clothes in the warehouse. Six months ago the Calais Jungle was demolished. Today the site is marked by “Do not enter” signs and recognisable only by a few remnants of the camp that once existed – scraps of plastic sheets, discarded sleeping bags, torn shoes, tear gas canisters and a haunting map of the old camp on a notice board near the entrance. Graffiti in the tunnel under the motorway at the entrance of the site reads “London Calling” and “No-one deserves to live this way”. The Jungle was a veritable city. With 10,000 people it had restaurants, a football pitch, clearly demarcated areas for various volunteer and migrant groups. Two migrants I met on the site from Pakistan’s Swathi Valley had previously run restaurants and lamented the loss of a community and their source of income in France. One had been in Calais for almost two-and-a-half-years and dreamed of going to the UK to claim asylum, reunite with friends and family and start a restaurant of his own. 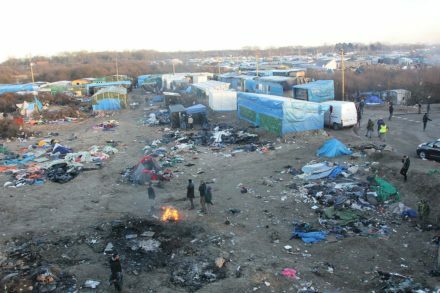 A recent survey undertaken by the Refugee Rights Data Project (RRDP), estimates that there are more than 400 people living in and around Calais, mainly sleeping rough in the forests or abandoned buildings that surround the old jungle site, or in newer camps which are controlled by criminal gangs. They are particularly vulnerable to violence and exploitation. Young people and children make up 43 per cent of the estimated population – and they suffer even greater risk of sexual exploitation, trafficking and mental health issues. Many hundred more live in camps in Dunkirk, though have been further displaced by intra-migrant group conflict and a fire that was set in the camp. France is still in a formal state of emergency, which makes it more difficult for refugee volunteer groups to do their jobs. Repeated and prolonged gatherings of 10 or more people are prohibited, and the mayor of Calais has attempted to take a hardline stance and ban food distributions in the town. When I visited, many of the organisations were also facing serious resource constraints – such as a lack of funds and lower levels of donations and volunteers in this period. What little they have is used to prepare thousands of meals on a daily basis for regular and emergency distributions. People will still come, whatever is agreed. More than two years on, my friend from Pakistan was still trying to get to the UK. Patrick Kingsley, in The New Odyssey, corroborates this view in interviews with smugglers and migrants in Libya. There was very little verifiable information available to migrants about EU rescue missions. In any case, it was almost too late by that point. Many people will have experienced harrowing journeys across the Sahara or escaping Syria, Iraq or Afghanistan to arrive in North Africa. Their experiences in Libya and Egypt are almost as bad with many facing exploitation, inhumane conditions in detention centres and a lack of right of work or send their kids to school. Many have their hearts set on Europe for a chance at a better life. This all means we must take measure to ensure that we addressing the problem at source, but we also need better management of the crisis in Europe to deal with people who are already here. Without a coherent strategy we risk inadvertently encouraging trafficking, as the UK’s support to Libya has been accused of doing. Migrants need objective information about their rights and what they can claim where. The RRDP found that only 12 per cent of migrants surveyed had accurate information about their legal entitlements. Equally in talking to people, there was a strong perception that some countries were more favourable for making asylum claims. The Home Office has recently released a tender for work to provide information to migrants in France. If this is anything like previous campaigns to curb immigration to the UK, it is likely to be designed to act as a deterrent rather than to provide objective advice about the process and chances of making a successful asylum claim in Britain. Charity groups in Calais are at present unable to provide this advice due to a lack of funds. One is in the process of launching an “info bus” which will provide migrants in Calais with access to wi-fi, some entertainment and advice. There are potential low-cost ways to reach a a majority of migrants in the area with this information. Many have access to mobile and smart phones. Calls and text to Lycamobile phones are free, and one charity has distributed an emergency number. There is potential to develop a simple yet effective mobile app or text service which will harness this access to technology. The groups working together in Calais are an excellent example of cross-European co-operation. Three organisations, both French and British, work side-by-side in the warehouse in Calais to prepare and deliver essential humanitarian support, where the state has been able to do so. People from all over the EU come together in common cause. I’m going back to Calais this bank holiday weekend to volunteer with the organisations and only hope that G7 leaders can be inspired by this commitment shown by their citizens. Jessica Toale is an international development specialist and former advisor to two shadow secretaries of state for international development.